I dont want to bore again by saying again and again that baking is one of my most favourite passion and i love to make varieties of bakes at home. Baking have became a part of my life and i love to challenge myself by participating in few of the baking challenges.Today my small group of friends are celebrating one among our friend, enthuastic blogger, a sister Shama Nagarajan who blog's about Easy 2 Cook Recipes. I know Shama since a long as a blogger, but before a year we got very closer by chitchatting through the famous social network. Now we talk to each other whenever time permits and the bond between us is growning on day by day. Shama wishing you a happy, wonderful and a blessed birthday with your loved ones. 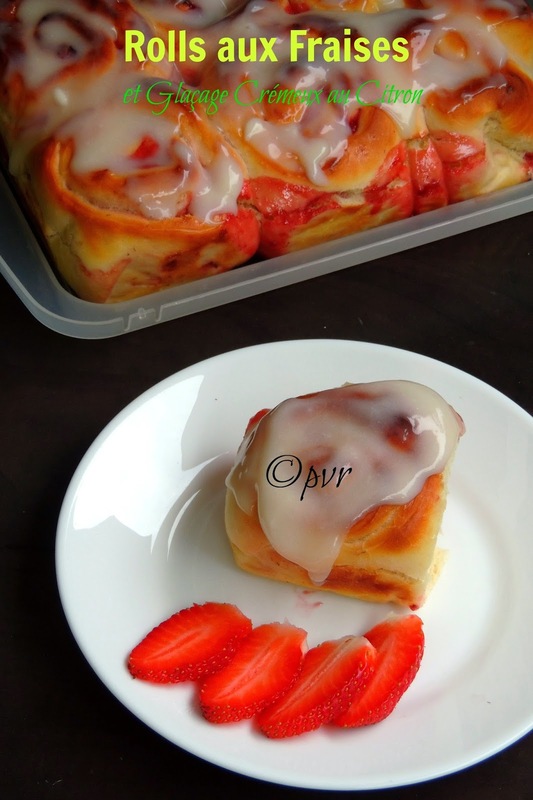 Coming to this strawberry rolls, this very addictive buns or rolls goes for strawberry marmalade, which plays an important roll in this fruit rich rolls. This marmalade gives an excellent flavor with a fruity rich texture to this eggless rolls. To make this rolls more interesting after baking and cooling completely the bread rolls,these rolls are topped with a super creamy glaze with cream cheese and lemon juice. These baked rolls are very simple to make, they will get vanished very quickly. An excellent evening snacks to have with your favourite drink, you can replace the strawberries with apple or pear chunks in case if strawberries are not available. You can also use chocolate chips or nutella spread instead of this strawberry maramalade. Mix the yeast with lukewarm water, keep aside until they turns foamy. Take the flour,vanilla essence, sugar, salt in a bowl, add the foamy yeast,luke warm milk and knead everything as a soft and smooth dough. Finally add the butter and knead again to make a smooth dough. Place the dough in a greased bowl, cover it with a towel, arrange the dough in a warm place. Let it sit for two hours. Punch down the dough and roll 2inch thick square, spread the marmalade generously and take care not to spread the marmalade much towards the edges, roll the dough tightly. Line a square baking tray with a baking paper,cut the rolled dough as medium sized pieces and arrange one by one slowly with some gap between them. Let it rise for half an hour in a warm place. Preheat the oven to 350F, arrange the baking tray in the middle rack of the oven. Bake for 30-35minutes until the crust turns golden brown. Transfer the baked rolls to a wire rack,let them cool completely. Meanwhile mix all the ingredients for the glaze as smooth paste. Drizzle the top of the rolls with this cream cheese,lemon glaze. Pull out a roll and enjoy for snacks or for breakfast. am drooling here.....send me some.Thank you akka , feeling blessed to be with you all. super yummy roll.. Can I have it for my breakfast tmr? Looks so yummy! Would love to have some! Send some here I will love to eat these. wow so yumm looking sis..
Nice colour n tempting rolls. We see so many bakes these days but Priya this one of the best roll I have seen.The roll just looks sooo beautiful and glaze is simply shining..love it. 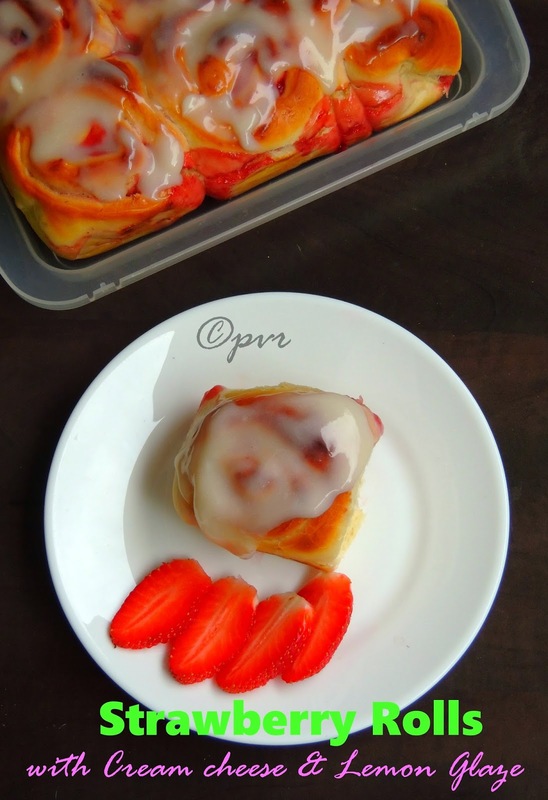 Awesome and delicious looking strawberry rolls. Excellent preparation displayed in the pics. It's so nice to make friends blogging. And these rolls look lovely. Strawberry is such a great flavor! Mouth watering here, looks so delicious and tempting..
looks so yum and well baked . Looks so delicious and tempting!!!! Rolls look so beautiful aks, nice treat do Shama ka, you always do best treats of birthdays.